A lifetime ago, on a frigid Toronto morning in a packed classroom, my enthusiastic university professor announced that we were about to begin the wondrous study of epistemology. Epistemology? Sounded like a rare tropical disease or a severe brain chill. Double wrong! Epistemology is the branch of secular philosophy that explores the nature of knowledge and establishes the principles of knowledge in all areas of study. Over many centuries, philosophers of all stars and stripes, from all disciplines and backgrounds, have searched — and still search — for knowable truths about themselves and the universe. They investigate the boundaries of knowledge, logic, perception, language, religion and more. They saturate their dense books with unsolvable questions, unprovable deductions, and often admit the existence of unknowable truths. In other words, can I acquire knowledge, whatever that means, only through personal experiences that utilize my five senses — sight, sound, smell, taste, touch? What about my sixth sense… my intuitions or emotions or group consciousness? What about my knowledge of languages and their limitations? What about my powers of memory? How can it be that years ago — or just last week — my subject matter knowledge was so extensive, so vibrant… but today, it’s poofed away? For example, I studied Latin for five years, and so intensely that I could read the poetry of Catullus in dactylic hexameter. But today, if I met a Roman Emperor strolling down the street, I couldn’t even exclaim, “The Roman Empire is in the dustbin of history while the Jews are still alive!” Where did my Latin go? Lost in the washing machine that consumes one sock from every best pair? Long before epistemology came into my life, I had firm beliefs about Orthodox Judaism that I considered to be self-evident truths. For years, I wondered about the source of my knowledge. From where did these ideas originate? I was just a first-generation Canadian Jew, born in an immigrant neighborhood, fluent in Yiddish, with no Jewish education, and a vaguely observant family. For starters, I believed Orthodox Jews never experienced severe illnesses, never got really sick, except for those nasty colds and flus everybody gets. Why so? Cruel diseases always passed over those who followed Hashem’s commandments. Many years later, I read in amazement, “If you listen to the voice of Your G-d, and do what is upright in His eyes and carefully heed His commandments and decrees, then any of the sicknesses that I set upon Egypt I will not set upon you, for I am Hashem, Your Healer” (Shemos 15:26). I also believed that Orthodox Rabbis — old men with beards, black hats, long coats, warm smiles, sparkling eyes — were really smart and knew special stuff that my family, teachers or libraries could never provide. Why so? Whenever a revered Rabbi from the Old Country came to Toronto, my father went to seek his advice and schlepped me along. I was happy to go and even happier when my parents did everything he told them to do… even if I didn’t understand it. Years later, I was fascinated to learn about the chassidic dynasties of Eastern Europe, their holy Rebbes, devoted followers, and the powers of emunah and bitachon. Furthermore, through careful observation, I knew Shabbos was a major experience that transcended our daily lives. Why so? Every Friday night, my mother lit two candles and prepared a bigger than usual meal, albeit the same menu, served on a white tablecloth. Times were tough, money was tight, everybody worked, me included. After dinner with no brachos or songs, life restarted as usual… except for one astonishing event. My father was a serious smoker, over two packs a day. We never pressured him to stop because that’s what men did in those days. Also, he said that smoking calmed him down after his backbreaking work in a clothing factory. For countless years, my frum grandmother, in sheitel and long dresses, lived with us. Every Shabbos, from candle-lighting to sunset the following day, my father never smoked, out of respect for my mother’s mother. Stopped cold turkey for 24 hours… a Ripley’s Believe It! As for Sukkos — this glorious Yom Tov has just ended. The intense memories of my first step into a sukkah, many decades ago, begin in Elul, end after Pesach and still pop up throughout the year. For me, the sukkah remains an assurance that Hashem is always here, standing behind the latticework, watching and leading. I knew nothing about Sukkos except… no school today. When I heard Orthodox Jews left their warm homes to live in unheated huts in freezing October, I was dumbfounded. Jews are smart — especially the Orthodox. Impossible. Fake news! Then one day during Sukkos, my ignorance was catapulted out of its comfort zone. My cousin invited my family, me included, for dinner in her sukkah, the first one she had ever constructed. For my parents and their families, the Yamim Nora’im ended at Yom Kippur, even though they were sukkah-aware. Somehow, this beautiful mitzvah was never transmitted to their children. Was it the allure of modern life in the new promised land or the necessity to provide basic essentials? 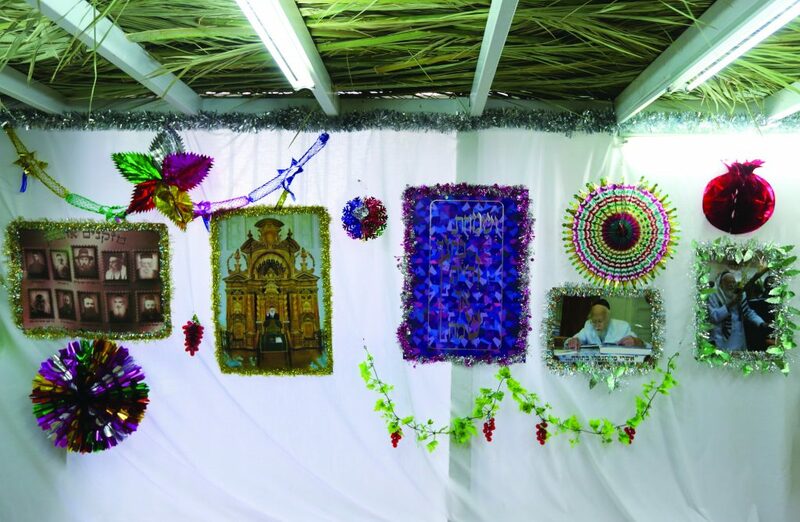 For my religiously removed cousin, the sukkah was just another way to flaunt her family’s brand of trendy Judaism. Always the curious academic, I researched Sukkos and the sukkah, albeit in non-Orthodox sources. Fascinated. Intrigued. My first-time-ever opportunity. Bottom line… we went. For him, the sukkah was a woeful reunion… but for me, it was a spark that kindled my destiny with Torah Judaism. The following week was the start of my third year at university. Soon, it became the start of my disenchantment with professors, philosophers and the theories they glorified. The first in the family to attend university, my goal was to get a Ph.D. in philosophy, which I considered to be the most exalted achievement of human understanding. Fortified with true answers to life’s questions, I would write earth-shattering books, nurture brilliant students, and delight in a blissful, doubt-free existence. “Many are the thoughts in the hearts of men, but it is the plan of Hashem that endures” (Mishlei 19:21). There were no dazzling “Eureka! I get it!” moments to make me realize that in secular philosophy, there was nothing to get. My studies into its many branches were mental gymnastics that twisted my brain muscles into pretzels. I was a walking dictionary of ’ologies, with my analytical abilities and methodological skills at an all-time high. But eventually, everything vaporized into nothingness. No foundation to provide support, no glue to make it stick. I recall the story of Rabi Akiva who saw dents in the rock caused by the incessant flow of water throughout many years, and took action. I also saw dents in philosophical theories that denied the existence of a Creator, proclaimed life as purposeless, provided no moral compass, and gave honor to philosophers with questionable lifestyles. I was just an unschooled Jew… but a Jew nevertheless, a pintele Yid, with innate knowledge of the Divine that emanated from someplace. Disillusioned yet determined, I embarked on a lonely journey to discover what Judaism had to offer — the only person among my family and friends to do this. It was a long‘n’rocky road, with sinkholes at every turn, including a 12-year incarceration in a Reform temple that preached dishonesty with arrogance. Ironically, this offensive experience served to enhance my appreciation of the Torah’s eternal values and enrich my heartfelt connection to authentic Judaism. Today, the world’s most fashionable secular philosophers are still stuck in the quicksand of epistemology. While they struggle to invent even more ’ologies to explain our existence, purpose and the universe, the Torah Jew knows — and has always known — the knowable truths. When I learned that I, little me, was at Har Sinai, a witness to awe-inspiring magnitude and majesty, I was speechless. At last, the sacred source of my knowledge was revealed. Man and his existence in this world do have purpose, with each of us assigned a unique mission as distinct as our faces. The purpose of knowledge is to lead us to the most complete level in the service of Hashem. “You shall observe the words of this covenant and you shall perform them, so that you will succeed in all that you do” (Devarim 29:8). Lashon Hakodesh, with which Hashem created the world, is the language of the Torah. Our man-made words can never equate or even describe the splendor, complexity, wisdom and sensitivity of this holy language and its emanations. Everything in the world is in the Torah, and the Torah is in everything in the world — it’s our eternal visitors’ guide for direction and protection in this world and the World to Come. Every word, every letter, every mitzvah contains Hashem’s prescriptions for our physical and spiritual well-being. On Pesach, we must eat matzah, but absolutely no chametz! We turn ourselves inside-out and upside-down to ensure our foods are kosher. Our Sages explain that these mitzvos concerning food provide inner light, ohr pnimi, an internal protection for our bodies during Yom Tov and also, we pray, throughout the year. On Pesach, it’s about the food we eat, and not where we eat it. On Sukkos, it’s about where we eat the food, and not about food restrictions. In the sukkah, surrounded by the Shechinah, shielded from the destructive forces outside, we gazed upwards, saw the heavens and stars peeking through the s’chach. Wrapped in Hashem’s eternal security blanket, we prayed that the outer light, ohr makif, enveloping us in the sukkah would also protect us from external dangers throughout the coming year. The halachos concerning the construction and care of the sukkah are many and mystical. In fact, the sukkah is so holy that we recited a farewell prayer upon our final departure several days ago. Maybe my father’s tears in the sukkah were also holy… and at the right time, they became so significant that through a roundabout path known only to Hashem, I became a Torah Jew.